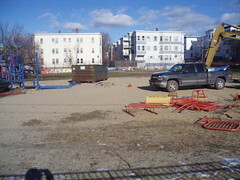 Cronin Park Demolition (and Renovation) has begun! Quirk Construction moved on site today to begin demolition of Cronin Park's existing structures as part of the park overhaul. The park renovation is being funded by the State Executive Office of Energy and Environmental Affairs and Community Development Block Grant Funding administered by the Community Development Department. The construction (and before that the design) is being managed by Groundwork Lawrence. The landscape architect for the project is Steven Cosmos (who also worked on Misserville Park among others). Please keep up to date with the work on the blog and on the Cronin Park Project Page!